Sao Tome and Principe, officially the Democratic Republic of São Tomé and Príncipe, is a Portuguese-speaking island nation in the Gulf of Guinea, off the western equatorial coast of Central Africa. It consists of two archipelagos around the two main islands: São Tomé and Príncipe, located about 140 kilometres apart and about 250 and 225 kilometres, respectively, off the northwestern coast of Gabon. The islands were uninhabited until their discovery by Portuguese explorers in the 15th century. Gradually colonized and settled by Portugal throughout the 16th century, they collectively served as a vital commercial and trade center for the Atlantic slave trade. Cycles of social unrest and economic instability throughout the 19th and 20th centuries culminated in peaceful independence in 1975. São Tomé and Príncipe has since remained one of Africa's most stable and democratic countries. With a population of 192,993, São Tomé and Príncipe is the second-smallest African country after Seychelles, as well as the smallest Portuguese-speaking country. The first stamps are issued in São Tomé & Príncipe in 1869. From the first issue, until the end of the colonial period, the issues are of the common designs for the Portuguese colonies. Since independence, São Tomé & Príncipe has issued many stamps aimed at the thematic collectors market. In the first years of indenpendncy, the country issued not more than 20 stamp a year, but since end of 1970th amount of stamps issued per year start grow rapidly. 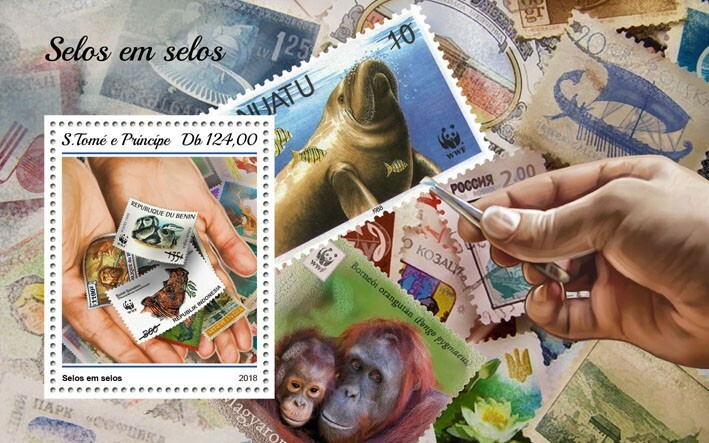 Philatelic agency Stamperija Ltd. – the authorized representative of São Tomé and Príncipe post administration (the issues of 2003-2004, 2006-now), prints hundreds of stamps a year on every popular them, most of them totally unrelated to the country, on behalf of the country. 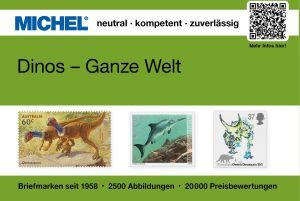 30.11.1982 "100 anniversay of death of Charles Darwin"  21.07.1993 "Dinosaurs"
01.03.2003 "Scouting Emblem and Prehistoric Animals"
10.01.2004 "Dinosaurs" 25.05.2006 "Dinosaurs and Minerals"
02.02.2007 "Neandarthal people and minerals"
29.05.2009 "Fishes and Shells (Dinosaurs)"
01.07.2009 " Charles Darwin and Dinosaurs"
15.09.2014 "Fossils and prehistoric age"
08.05.2017 "135th memorial anniversary of Charles Darwin "
 "100 anniversay of death of Charles Darwin" - even though Darwin's theory of Evolution is the basement of Paleontology science, only few Dinosaurs were know at his time. Charles Darwin depicted on one of the stamps. Neils Stensen who is also known s Nicholas Stenno (1638 - 1686), Denmark was a Danish pioneer in both anatomy and geology. He is considered the father of geology and stratigraphy. October 1666 two fishermen caught a huge female shark near the town of Livorno, and Ferdinando II de' Medici, Grand Duke of Tuscany, ordered its head to be sent to Steno. Steno dissected the head and published his findings in 1667. He noted that the shark's teeth bore a striking resemblance to certain stony objects, found embedded within rock formations, that his learned contemporaries were calling glossopetrae or "tongue stones"
 Charles Darwin and Carl Linnei are depicted on some stamps of the set. Alfred Russel Wallace (1823-1913) was a British naturalist, explorer, geographer, anthropologist and biologist. He is best known for independently proposing a theory of evolution due to natural selection that prompted Charles Darwin to publish his own theory. Dinosaurs per definition are terresial animals. "Flying Dinosaurs" is incorrect name, it has to be called flying reptiles, scientific name: Pterosaurs. Ursus spelaeus (Cave bear) on third stamp of Mini-Sheet of 4. 13.03.2018 "Famous persons" 18.09.2018 "Stamps on stamps"
[A2] On September 18th, 2018 Stamperija on behalf Sao Tome and Principe issued two stamp sets "Stamps on stamps" . Both sets have the same design but different face values. 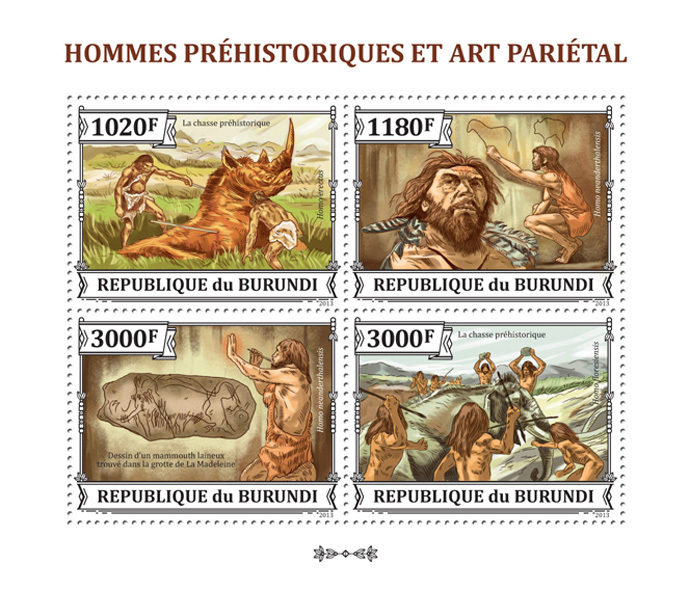 Burundi's stamps from 2013 with "Homo neanderthalensis", also issued by Stamperija, shown on stamp of the Blocks.